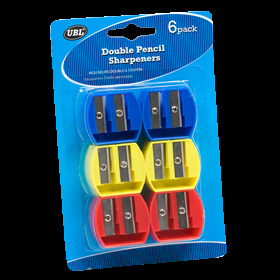 Pencil Sharpeners Dual Hole 6Pk. 30 x 35 x 15mm. Blue | Red | Yellow - 2Pc Each Colour Per Pack. PP Plastic. 6G Packaging: Blister Card.